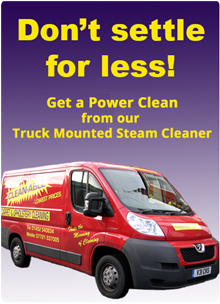 Our powerful truck mounted machine makes light work of any carpet cleaning job. Clean-Able takes the Strain out of Stains! Clean-able can power clean your carpets with our NEW truck mounted “Red Bull” Cleaner giving a deeper carpet clean, removing even the most stubborn dirt. We have many satisfied customers while using one of the largest and powerful truck mounted machines in the UK. It cleans at up to 5 times more power than any electrical machines. No water or electricity needed as it is a completely self contained unit. We have been operating since 1994. Since then we have cleaned carpets and upholstery in thousands of homes across Gloucestershire, Cheltenham, Bristol and Swindon . We have contracts at various offices, pubs and clubs as well as putting a lot of effort into the home domestic scene. To find out what our many happy customers say about us click here to read our testimonials. To get a FREE online quote or let us ring you back, click here Online Carpet Cleaning Quote to find out more about our excellent Carpet and Upholstery Cleaning services. We are not a franchise and offer better value for money to you the customer.